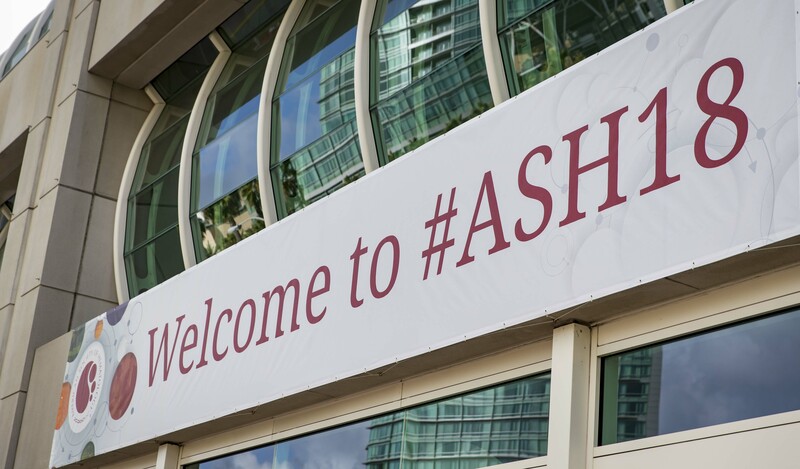 The last few days of the American Society of Haematology (ASH) annual congress saw a series of new trials on CAR-T therapies that reinforce the emerging role of this type of cancer immunotherapy. Among the highlights, Allogene and partner Servier presented phase 1 data for its ‘off-the-shelf’ CAR-T therapy UCART19 in acute lymphoblastic leukaemia (ALL), making the case for an easier to administer therapy that doesn’t require the process of harvesting, modifying and re-infusing cells needed with autologous CAR-Ts. Among 17 patients who received a lymphodepletion regimen of the chemotherapy agents fludarabine and cyclophosphamide with Allogene’s anti-CD52 antibody ALLO-647, designed to give the CAR-T cells space to grow, 82% achieved a complete response or complete response with incomplete haematological recovery (CR/CRi). There was little expansion of the CAR-T cells in a group who did not receive the anti-CD52 therapy, and overall 67% (14/21) of patients achieved a CR/Cri. Allogene’s co-founder and CEO David Chang said discovering the importance of the anti-CD52 element was critical in its future plans for off-the-shelf CAR-Ts, and would now been incorporated in a programme in non-Hodgkin’s lymphoma due to start next year. Back in the realm of ‘conventional’ CAR-T, China’s Legend Biotech posted encouraging data from a phase 1/2 trial of its Johnson & Johnson (J&J) partnered anti-BCMA therapy LCAR-B38M, including an 88% overall response rate among a group of 57 patients that analysts suggest seems to hold up well against data presented by Bluebird Bio for its CAR-T bb21217 earlier at ASH – with the usual caveats about direct comparisons at this early stage. Despite a median of three earlier lines of therapy, 42 of patients (74%) achieved a complete response, and of those 39 (68%) tested negative for minimal residual disease (MRD) in their bone marrow. The median duration of response was 16 month, and median progression-free survival (PFS) was 15 months. There was plenty more activity on the anti-BCMA CAR-T front at ASH. Celgene and Juno’s JCARH125 also hit the mark in heavily pre-treated myeloma patients in the EVOLVE study – among 44 evaluable patients who had failed around seven lines of therapy, the overall response rate was 82% (36 patients). At the lowest dose level of, the response rate was 79%, with 43% of patients achieved stringent complete response (sCR) or complete response (CR). Another anti-BCMA player – Poseida Therapeutics – presented preliminary data on 19 myeloma patients who had a median of six prior lines of therapy. Treatment with its P-BCMA-01 therapy achieved a response in 15 of them (79%), with five showing no evidence on MRD, and the company now says it intends to start a pivotal trial in preparation for filing by the end of 2020. Meanwhile, Gilead Sciences’ Kite subsidiary reported updated results from a phase 1/2 trial (ZUMA-3) of its CD19-targeting CAR-T KTE-X19 (formerly KTE-C19) in adult patients with relapsed or refractory (r/r) acute lymphoblastic leukaemia (ALL), revealing that 69% of patents achieved a CR/Cri after a median follow-up of 15 months. All 25 of the patients in the study had undetectable minimal residual disease, meaning they were less likely to relapse, and on the strength of the data Gilead has now initiated a phase 2 study in a larger set of adult patients with ALL. Gilead also had new, two-year data to share on its already-marketed CAR-T Yescarta (axicabtagene ciloleucel) in r/r B-cell lymphoma that showed a sustained treatment effect, answering what some commentators think is a reason (alongside price and reimbursement) for sluggish uptake of first-generation CAR-Ts. After median follow-up of 27.1 months and a minimum of 24 months after a single infusion of Yescarta, 39% of patients maintained their responses, according to data from the ZUMA-1 study. The best objective response according to investigator assessment was 83% 84 of 101 patients) at year two, including 58% with complete responses. Similarly, CAR-T pioneer Novartis reported longer-term data on Kymriah (tisagenlecleucel) in children with r/r ALL and adults with r/r diffuse large B-cell lymphoma (DLBCL) that it said “underscore the longer-term durability of response with Kymriah and its consistent safety profile”. An updated analysis from the ELIANA trial in children with ALL revealed an 82% remission rate within three months, with a relapse-free survival rate of 62% at 24 months and no median duration of remission yet reached. Longer-term follow-up from the JULIET study in DLBCL found a 64% relapse-free probability and a 43% probability of overall survival at 18 months, with median duration of response still not reached.